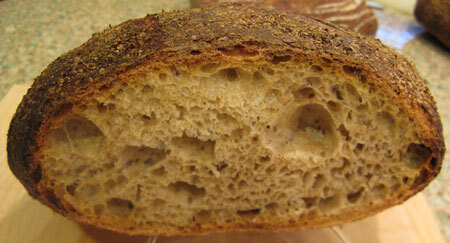 I so enjoyed reading about Pane casareccio di Genzano in Mr. Leader’s book, Local Breads. This is a try of the whole wheat variation, Pane lariano, with some variations; I reduced the instant yeast to 1 gram, mixed by hand, divided the recipe amount into two loaves (instead of one large loaf), and retarded the dough overnight (for convenience)…so this is not the bread Mr. Leader intended…but I am very pleased with the resulting flavor (it’s a delicious, delicious crust!). The loaves were baked in a hot oven, preheated to 500F; then 475F for 15 minutes, 465F convection for 15 minutes, 450F convection for 7 minutes, then left in the oven (turned off/door ajar) for 10 minutes. but really happy with the crust! The second bake today, Shiao-Ping's Banana Pain au Levain, makes a beautifully moist and fragrant loaf; I used a combination of fresh and frozen (defrosted) banana, ripe and sweet. The sweetness and flavor of the banana really carried through to the baked bread - great flavor! What wonderful discoveries these two breads were, today. Beautiful ... the Pane lariano is just beautiful. Lovely crust ... Oh how I love a dark crust! The banana bread sounds great too. Lovely bake breadsong. The description of the crust in Mr. Leader’s book, and actually seeing the ‘real thing’ thanks to Jay’s post, were so helpful in terms of a goal to shoot for when baking the Pane lariano. 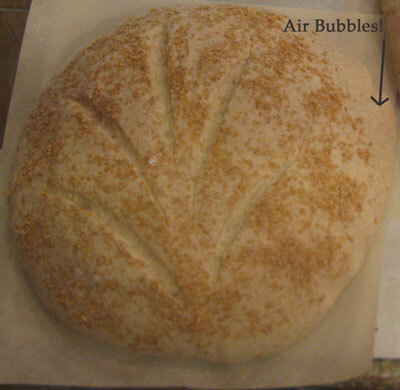 It's one of the breads I've always wanted to have a go at, and never yet done. Terrific job you have made, and the crust is lovely, in spite of you not having a brick oven. One day?! Do you think the overnight retard may have contributed to the big holes in the crumb at the edges of the loaf? A WFO is something I’ve been thinking about for a very long time…seeing the gorgeous results you and so many others get from your brick ovens...making me wish I had a WFO here! 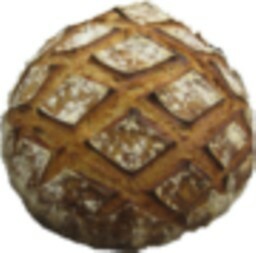 Thank you for the compliments on the bread, and the crust, and please do give the Whole Wheat Genzano a try. It had such an amazing flavor! Great baking breadsong! I can see the resemblance to a banana. I really can! I was trying to work out what you were trying to score on that loaf before I read your comments. Although I didn't know what it was at first, I knew it wasn't just random scoring. If it was breadsong, there had to be a plan behind it! I can see how you double scored the top of the banana to create the effect of the stalk where the banana joins the tree. Perhaps the bottom end is a little too sharp, but if you work out how to score that so it is more rounded, I think you deserve some sort of a medal! 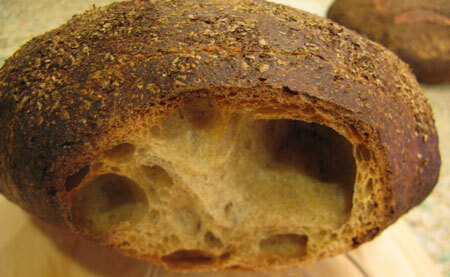 Anyway, lovely looking bread all round and I particularly like the crust on the whole wheat. Thanks so much Syd, and I’m happy you liked the crust on the Genzano! I was excited to see your post with these gorgeous breads. The Genzano is one that I learned from Dan Leader before Local Breads came out, and I'm sure yours would make him proud! The class was at the Institute of Culinary Education in NYC, and in fact he mentions the class and mentions me (!!) in the last paragraph of his introduction to Local Breads. I happened to see him at his bakery in the Catskills after the book came out and he brought me over to a stack of the new books, opened it to that page and gave it to me to read. I was beyond astounded! Anyway, I love the crust you got and if I didn't have two different breads rising downstairs right now, I'd be inspired to start a Genzano. And I agree with Syd -- good job on that banana!! This looks like a fantastic loaf; I just have to try it. Thank you, breadsong! And, how wonderful you had the opportunity to take his class! so I can discover more of Mr. Leader’s beautiful breads! I can honestly say, I feared I’d made a mistake retarding the dough as it really did continue to ferment, even under refrigeration. 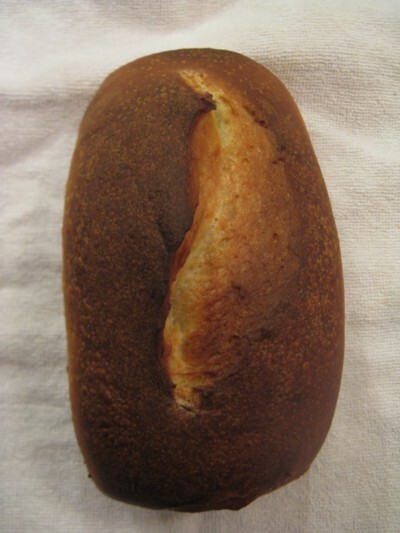 When writing about this bread, Mr. Leader noted “a quarter-inch thick charred crust”; so in the end I was grateful for those air bubbles, as it really gave me a good view of the crust that resulted from this bake. I was hoping for a crust like Mr. Leader described, and I can only imagine the crust that might result if the loaf were baked in a WFO like yours! You did a great job on both of these loaves. Shiao Ping's is one of the first I baked and my family loved it right off the bat. I love the texture of that dough when working with it and the aroma when it is baking. You have described it well! I also love the simplicity of the method. P.S. Don't know if you are interested in baking more breads using bananas but if you are....txfarmer has a great loaf combining them with whole wheat flour. It is a sandwich loaf and also very tasty. 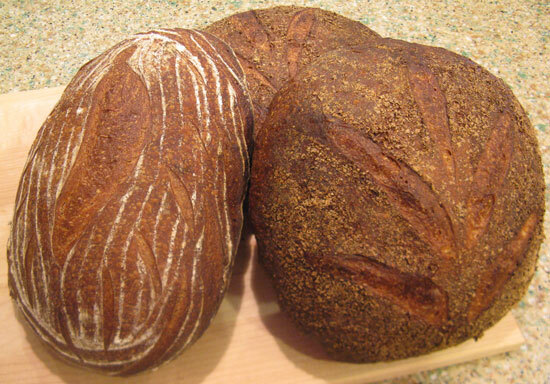 I appreciate your comments, and thanks for the link to txfarmer’s bread (that’s a beauty; having loved Rose’s bread, and Shiao-Ping’s, txfarmer’s seems like a perfect marriage of the two, and love that it was made with whole wheat!). ...and yes, the banana definitely comes through on the crust. What a lovely design! The crumb is to die for too... The crust on the Genzano bread is fantastic. I can almost hear it sing and crackle all the way from down south in Seattle! Bravo, breadsong! Hi MC, and thank you so much! It was your ‘Light as a banana’ bread that inspired me to bake Rose’s bread so long ago, and I was thinking of your bread when making Shiao-Ping’s too. Thank you so much for your compliments on these breads - so appreciated! is right, brown food tastes good!' The crust on the Pane lariano is so amazing - it must be delicious. Can't smell the bananas until we demand and get smell - o - vision for TFL crowd :-) Shiao - Ping has some fine recipes desn't she? These are very nice loaves! You must bake this bread of Shiao-Ping’s so you can experience the lovely aroma of the baking/baked banana loaves for yourself! I agree with you, Shiao-Ping’s baking is really, really lovely and I look forward to trying other recipes of hers. Thank you very much for your comment and glad you liked these loaves! You shouldn't have waited so long to make these beautiful loaves breadsong! The Genzano CB looks sooo good with it's bold bake and cracking crust, it speaks flavour from every angle, and every bite as well, I'm sure. Ever since reading Shiao- Ping's post on her Banana Pain au Levain I've tried to wrap my head around how the flavours of a naturally leavened bread and banana would work together, but it still eludes me. Something I'll have to try for myself at some point it seems. The loaf looks amazing, adorned with your trademark artistic scoring, and moist looking crumb, it's a pleasure just to see. Your posts are always a treat, thanks for sharing your latest bakes with us! It’s true – baking these was ‘bittersweet’ – happiness to have made them, but also a pang of regret for waiting so long to bake such delicious bread. I am so glad you liked the look of both of these; I loved the flavor of both, and was so pleased that the banana flavor shone through on Shiao-Ping’s loaf. I love the flavor of banana and am partial to sweet/fruity, so this was a really nice one to try. And Mr. Leader’s bread, well, that was nothing short of fabulous for flavor and I am really looking forward to making this one again! Thanks so much, Franko; I so appreciate your compliments! 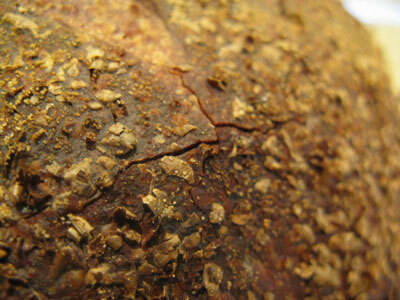 The crust on the Genzano does look delicious! I'm so grateful for your comment and so happy these loaves have been well-received! 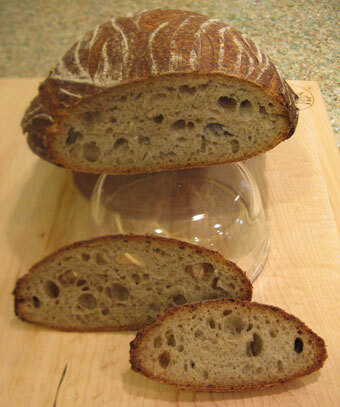 The Genzano was a joy to make and taste, as was Shiao-Ping's banana pain au levain.